Almost three quarters of a million people around the world have signed an online petition that brands the Trans-Pacific Partnership (TPP) agreement a “threat to democracy” and a “corporate takeover”. 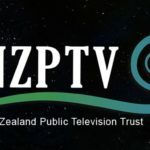 The petition will be presented to New Zealand delegation that is hosting the current round of negotiations, outside the Sky City Convention Centre at 2.30pm tomorrow. 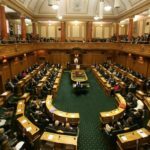 “Many hundreds of thousands of people from around the world have sent a blunt message to politicians and corporations who tout the TPPA as a model for the 21st century that it does not represent not their 21st century”, said Jane Kelsey, who has been asked to present the petition to the negotiators. 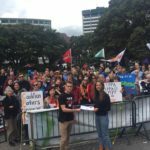 Delivery of the petition will be the centerpiece of a protest rally and street theatre tomorrow, Saturday 7 December starting at Aotea square at 2pm and moving toFederal Street outside the convention centre. The petition was organised by Avaaz.org, a global web movement that aims “to bring people-powered politics to decision-making everywhere”. It specialises in online petitions “to ensure that the views and values of the world’s people inform the decisions that affect us all”. The online petition went live the week before the Leesburg round in the USA in September 2012 and reached 350,000. Avaaz staff projected the petition on the wall of the hotel where the negotiations were taking place, but security shut them down! Since then, hundreds of thousands more have signed, reflecting a growing groundswell of resistance to the TPPA and similar treaties.